Understood simply, Eucharistic Adoration is adoring or honoring the Eucharistic Presence of Christ. In a deeper sense, it involves "the contemplation of the Mystery of Christ truly present before us." 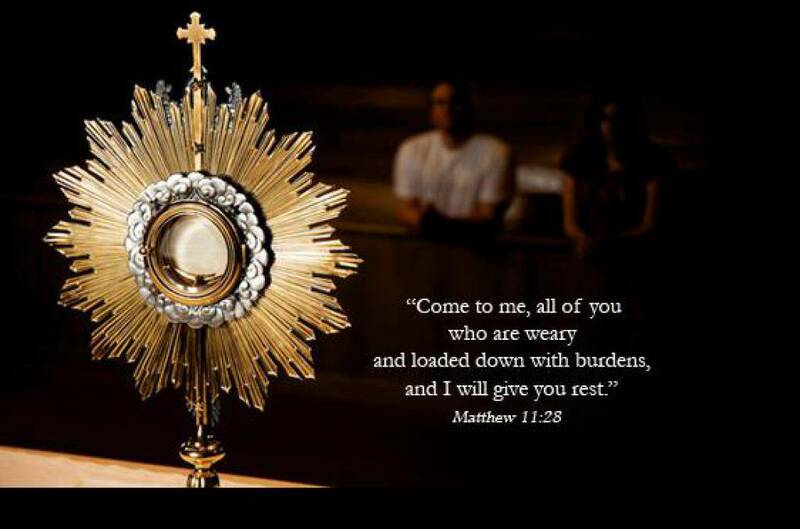 During Eucharistic Adoration, we "watch and wait", we remain "silent" in His Presence and open ourselves to His Graces which flow from the Eucharist ... By worshiping the Eucharistic Jesus, we become what God wants us to be! Like a magnet, The Lord draws us to Himself and gently transforms us. Feel free to bring your families as well! Creating a sense of quiet and reverence in our young people is a great thing!